Artist Residencies & Conflict Areas engages artists, independent arts organizations, residency programmers, and community initiatives on specific areas and conceptions of conflict. Issues for discussion will include mobility, community outreach, and exchange of knowledge through the broadly-interpreted artist residency model. On June 24, the panel examines the topic of art residencies & conflict areas from a broad perspective. On June 25, the format allows participants and audience members to "zoom in" on the topic using four mini-case studies about identifying conflict in a given community context, an area of growth that the artist residency sector must embark upon in order for the social practice of artist residents to be relevant to the communities in which artist residencies are accommodated. This is immediately followed by questions/observations from the moderators, after which the discussants (project leaders) form a panel to answer questions from the floor about the cases and/or questions about projects held by audience members. While the format is not intended as a dichotomy, some of the participants fall into the category of 'senders' (Bronx Museum, Apex Art), supporting artists' residencies around the world, and others as 'receivers' (Guapamacátaro residency; Corona, Queens; post-earthquake Haiti), communities that host artists and incorporate them into sensitive processes critical to the community's health, safety, and recovery from hardship. This event is initiated by Residency Unlimited, and co-organized by Residency Unlimited, freeDimensional & The Creative Resistance Fund, and independent researcher Gaby Ron. The program is supported by the Goethe-Institut New York. - Who defines conflict and to what extent does it fall prey to Western narratives (e.g. development, humanitarian assistance) that justify intervention? - Can their be standards for visiting artists’ relationships with host communities? - What happens after the residency is over? Does an 'art for art sake' approach work in 'conflict areas'? - Mobility: Who has the permission to go where in the world? 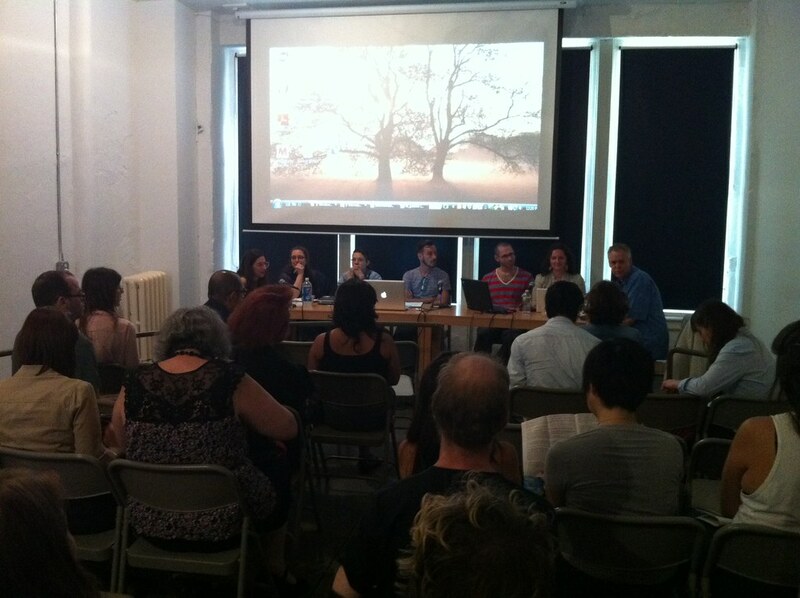 - Can programming or accepting an art residency be a political act? - What can we learn from mobile and site specific residency models as tactical approach to space precarity? - 2-4pm Moderators Bill Cleveland and Gaby Ron ask questions and share observations of differences/commonalities among the mini cases. Break-out sessions are encouraged if time permits. * Immigrant Movement International is a long-term art project in the form of an artist-initiated socio-political movement. Tania Bruguera is spending a year operating a flexible community space in the multinational and transnational neighborhood of Corona, Queens, which will serve as the movement’s headquarters. Engaging both local and international communities, as well as working with social service organizations, elected officials, and artists focused on immigration reform, Bruguera will examine growing concerns about the political representation and conditions facing immigrants. * Guapamacátaro has had to alter the format and timing of its residency program in Michoacán due to narco-violence, having to worry about real safety as well as artist residents’ interpretations surrounding the War on Drugs. * We Who Feel Differently (2011) by Carlos Motta is a database documentary addresses this question of sexual difference and other critical issues of contemporary queer culture. We Who Feel Differently attempts to reclaim a queer “We” that values difference over sameness, a “We” that resists assimilation, and a “We” that embraces difference as a critical opportunity to construct a socially just world. In addition, author Bill Cleveland brought 10 copies of each publication Between Grace and Fear: The Role of the Art in a Time of Change and Art & Upheaval: Artists on the Worlds Frontlines and made himself available for book signings. And independent researcher Gaby Ron prepared topical video and text material available to the public throughout the event. Fund, and independent researcher Gaby Ron.